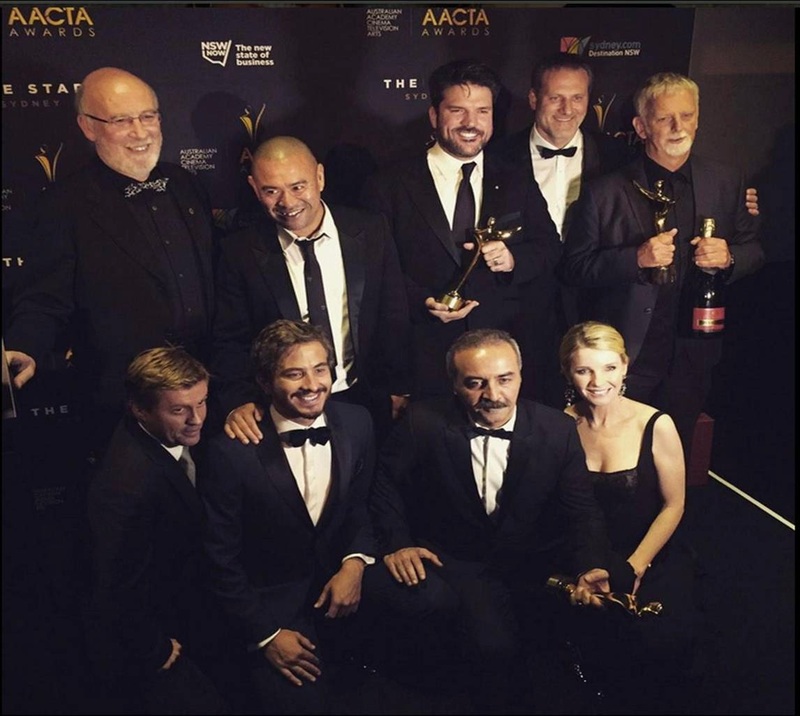 Russell Crowe’s directorial debut The Water Diviner was voted joint Best Film at the Australia Academy of Cinema and Television Arts (AACTA) Awards, held in Sydney, on Thursday night. Yılmaz Erdoğan, who starred in the film, won Best Supporting Actor. Written by Andrew Anastasios, The Water Diviner is an historical drama set in the aftermath of World War I. An Australian father travels to Turkey to try to find his three missing sons who had signed up to fight for the Allies against the Ottoman Turks in the Battle of Gallipoli (Çanakkale) in 1915-16. Crowe plays the father Joshua Conor, while Erdoğan takes up the role of Major Hasan. The film, which has several Turkish actors including Cem Yılmaz and former Bond girl Olga Kurylenko, has been well received by the critics. It uniquely seeks to portray both the Turkish and Australian perspectives about the Battle of Gallipoli, which claimed over 110,000 lives and resulted in some 230,000 persons wounded. A successful writer, director and actor in Turkey, this was the first time Erdoğan had appeared in an English-language film and also the biggest budget production of his career. He beat three others, including Robert Pattinson, to win the AACTA Best Supporting Actor award on Thursday. On receiving his trophy, Erdoğan told the Sydney crowd “Thank you mate”, demonstrating the good Aussie traits he had picked up during filming. The Water Diviner was up against five other contenders. It went on to share the AACTA 2015 Best Film honours with The Babadook. Crowe joined the awards via video-link as he was on set filming in Los Angeles. The film opens in the UK on 3rd April 2015. See the trailer here. Doğu Perinçek, chairman of the Turkish Workers' Party and an MP, is back at the European Court of Human Rights (ECHR) to defend his right to freedom of speech. He was found guilty of genocide denial and racial discrimination in Switzerland in 2007, but had his conviction overturned at the ECHR in 2013 in a case supported by the government of Turkey. 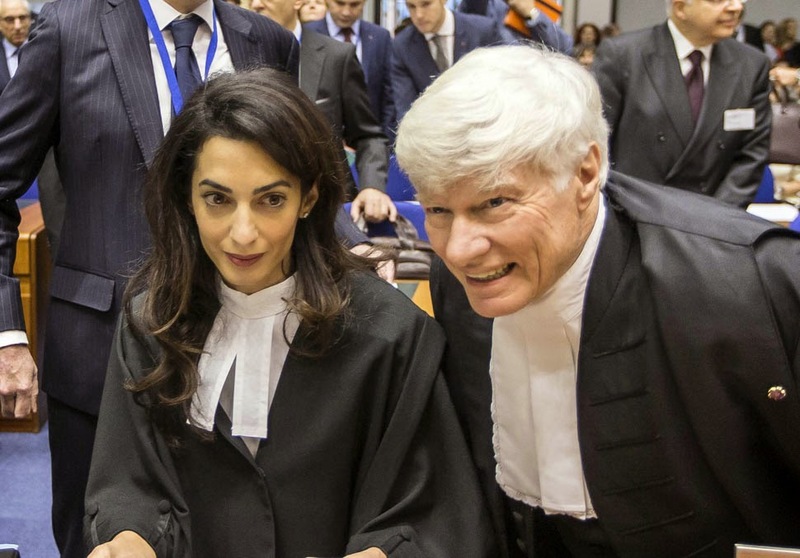 Switzerland appealed the decision and since September, Armenia has also become a party to the case, represented by barristers Amal Clooney and Geoffrey Robertson QC of Doughty Street Chambers. 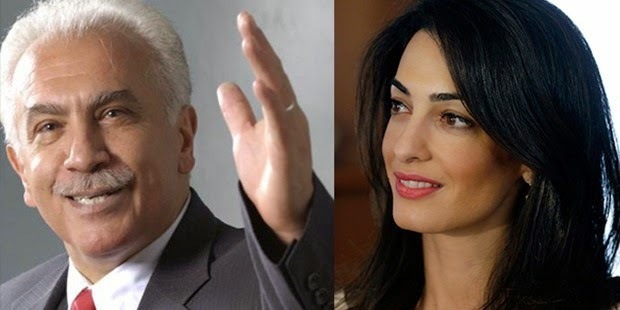 At the ECHR yesterday, Mrs Clooney accused Turkey of double standards on freedom of expression for defending the Turkish Leftist who described the Armenian genocide an "international lie". She said Turkey's stance was hypocritical "because of its disgraceful record on freedom of expression”, pointing to the prosecutions of Turkish-Armenians such as the late Hrant Dink who campaigned for the1915-16 massacres to be called a genocide. She also told Strasbourg court’s judges they were “simply wrong” for failing to uphold Swiss laws to prosecute those who deny the Armenian genocide. Previously, the European court concluded that there was not a “general consensus" that the massacres of Armenians had constituted genocide and that only 20 countries out of 190 worldwide classed it as such. Only three European countries, Greece, Slovakia and Switzerland, ban the Armenian genocide denial. The French had also tried, but the decision was overturned on free speech grounds in the country’s constitutional court three years ago. Perinçek reiterated the ECHR’s 2013 decision and reminded the court that the ruling had determined that opinions on the 1915 incidents were still disputable. He stated that genocide was a “judicial phrase” and his personal studies indicated that the Ottoman Empire did not act with a motive to completely destroy Armenian society in Anatolia. He admitted that there were “forced migrations and mutual slaughter,” but claimed that discussion of the events had become a taboo and the term genocide has become a way to insult Turks in Europe. During the two-hour hearing, Perinçek’s lawyers Mehmet Cengiz and Stefan Talmon also underlined the right to freedom of expression in Europe. The ECHR’s Grand Chamber, comprised of 17 members, will give its final decision in the coming months. Its ruling will not determine whether the Armenian massacres amounted to genocide, but simply whether Switzerland’s laws infringe Doğu Perinçek’s freedom of expression. 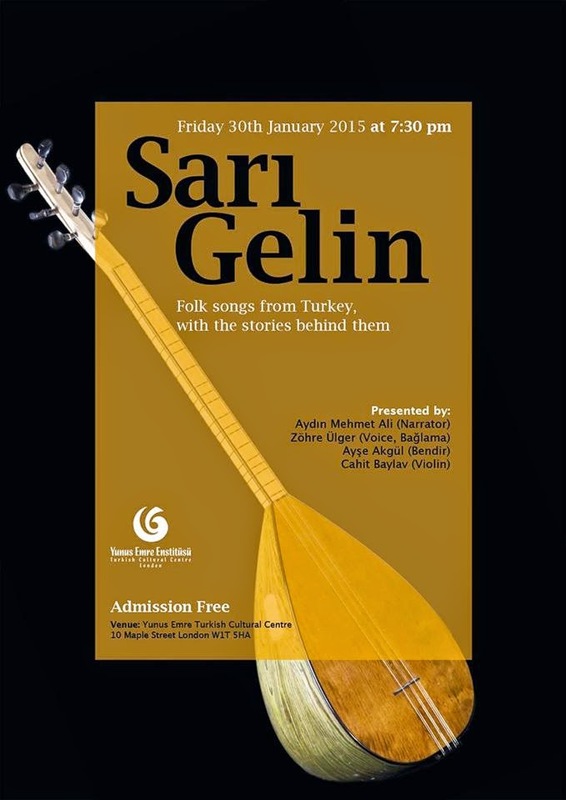 The Yunus Emre Institute is staging a free folk music concert at its central London venue this Friday. The special event includes narrator Aydın Mehmet Ali, who will explain the story behind each song, which will be performed by Zöhre Ülker (vocals, bağlama / long-necked lute), Ayşe Akgül (bender / frame drum) and Cahit Baylav (violin). Sarı Gelin means ‘blond bride’ in Turkish and commonly refers to the name of group of folk songs about a young man lamenting that he cannot be with a girl he has fallen in love with because he is Muslim Turkish and she is Christian Armenian. Originating from eastern Anatolia and the Caucasus region, there are multiple versions of the music and lyrics that are regularly performed in Turkey, Azerbaijan and Armenia. Part of a global network of Yunus Emre Institutes, the London centre was opened by President Abdullah Gül in 2010. The YEI aims to share Turkey’s cultural richness by offering a range of services, from Turkish language and arts classes to workshops and hosting cultural events and exhibitions. Şaban Kazim emerged the winner from last month’s competition for amateur stand-up comedians at the world famous Comedy Store in Leicester Square. The 31-year-old competed against 25 other acts to make it through to the final, where he beat five others to take the King Gong award. 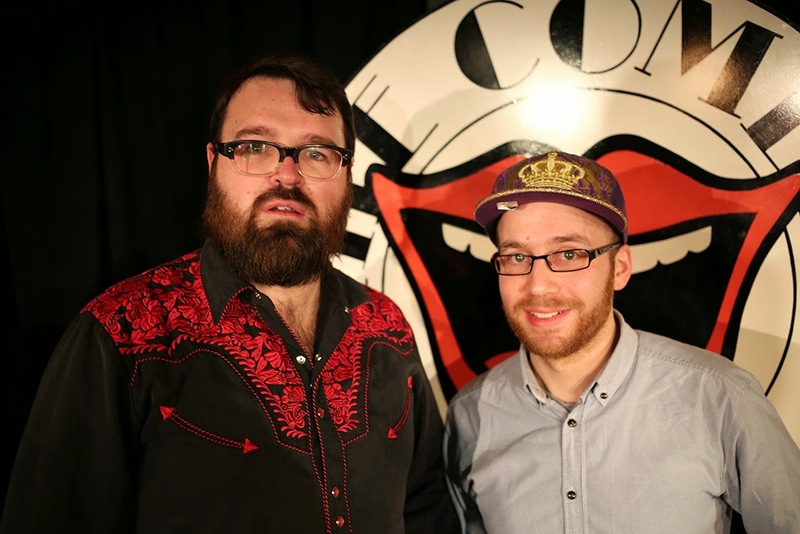 The southeast Londoner wasn’t on the original line-up for the Comedy Store King Gong competition, which takes place on the last Monday of each month. The event is open to the public and many budding comedians register months in advance for a chance to perform at the renowned venue. However, some drop out at the last moment and others fail to go the distance, which is how Kazim came to take part on 29th December. King Gong competitors each have 5 minutes to perform their jokes. The Comedy Store compère randomly chooses three members of the audience who are each given a red card to display for poor gags and performances. If all three show a comedian a red card, they are ‘gonged off’ to the sounds of Queen's Another One Bites the Dust. Those who remain on stage for the full 5 minutes walk off to Hallelujah, and return the same evening for the finals where there is a ‘clap off’. The sound levels are measured as the audience cheers and claps for the finalist they thought was best and the comedian with the loudest support wins the King Gong. 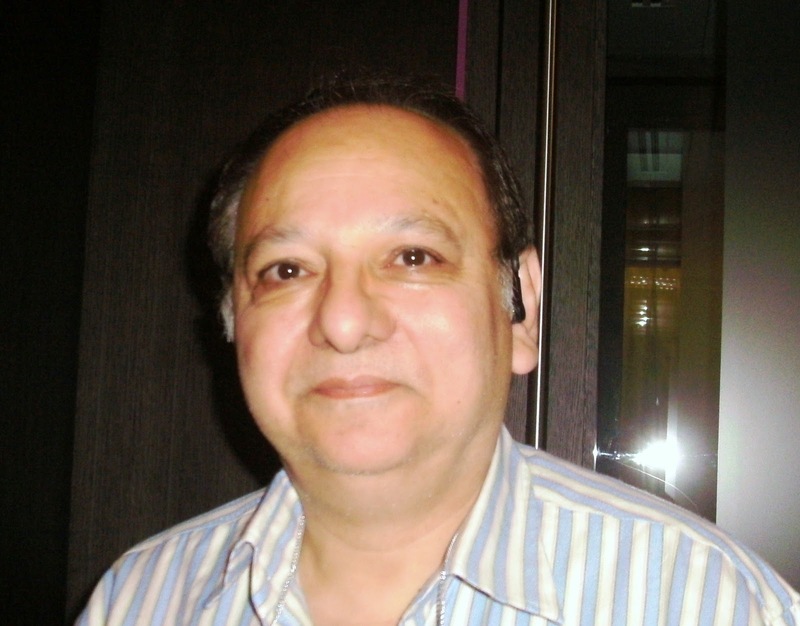 A graphic designer by profession designing leaflets and packaging for the British Turkish food industry, Kazim had put himself forward for the King Gong a few years earlier. He was heckled quite badly and was gonged off after 3 minutes 40 seconds. He told T-VINE, he had attended December’s Comedy Store event intending just to watch the performances. Kazim is working on his new routine. Here’s the performance that made him a winner at the Comedy Store in December. 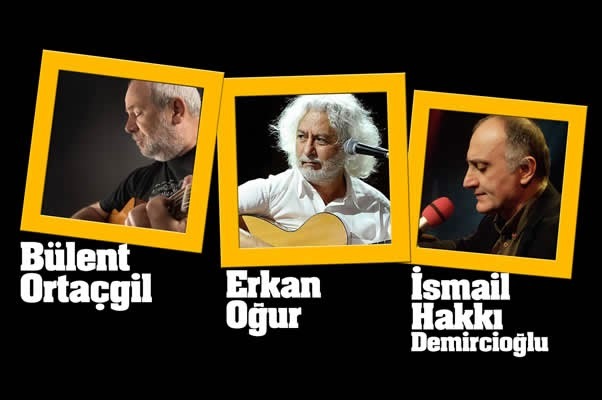 Three Turkish folk music legends take to the stage in London this Saturday to perform popular new and classic Turkish folk and Anatolian rock songs. Bülent Ortaçgil is a guitarist, composer and singer who first stared recording music in 1971. His career has led him to work with some of Turkey’s leading musical lights including Onnu Tunç and Erkan Oğur, performing on numerous albums that have straddled multiple musical genres from Rock to Jazz, and Turkish Blues. Oğur is regarded as a master of the kopuz and bağlama lutes. He plays many other stringed instruments and invented the fretless classical guitar while he was working with American Blues artists such as Robert 'One Man' Johnson in the USA in late 1980s. His improvised style and Turkish Classical and Folk music compositions, which include award-winning film scores, have made him popular across Turkey and he also regularly performs abroad. İsmail Hakkı Demircioğlu plays numerous stringed instruments including bağlama and bass guitar. He has performed on the albums of numerous artists and regularly plays with Oğur, the two of them releasing three albums between 1998 and 2003. A few tickets are still available – buy online or from the venue on the night. The event is organised by Studio Live London, who have organised numerous Turkish concerts in the capital including Emre Aydın and Mor ve Ötesi. Saturday night’s concert is sponsored by Ersan & Co Solicitors. 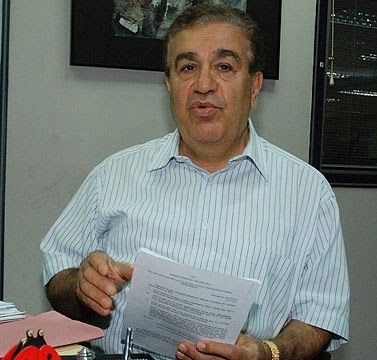 A former director of the Cyprus Islamic Trust (Kıbrıs Vakıflar İdaresi) will be in London to give a series of conferences about the ownership of Evkaf land in Cyprus. Taner Derviş, who headed up Kıbrıs Vakıflar İdaresi for five years, will shed light on the hotly contested ownership of Maraş / Varosha – a seaside town uninhabited since the 1974 War in Cyprus. 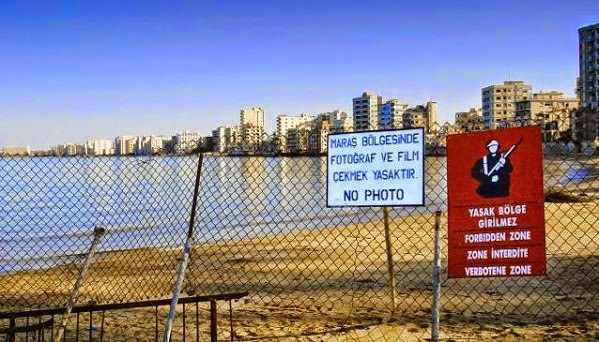 In recent years, the international community has called on the Turkish side to allow the original owners to return to the once popular resort town in Famagusta, in northeast Cyprus. The issue has been at the centre of various European court cases and last autumn, Maraş was also the focus of an ITV documentary. The Turkish side reject Greek Cypriot claims of ownership, asserting that Maraş is primarily Evkaf property – that is land owned and gifted by Cypriot Muslims to fellow Muslims for their use and enjoyment in perpetuity. The Kıbrıs Vakıflar İdaresi is a religious charitable trust that was founded in Cyprus in 1571 – the year the Ottomans conquered the island. Evkaf property continues to be administered by this trust to this very day, and its remit and terms of operation have not changed since its inception nearly 450 years ago. The body is a member of Brussels-based European Foundation Centre and it is also acknowledged in the Republic of Cyprus constitution as the primary religious trust for the island’s Muslim population. It is in this legal and historical context that keynote speaker Derviş is expected to explain why Evkaf continues to assert it is the real owner of property in Maraş and indeed the largest landowner in Cyprus. His talk will cover the status of the Cyprus Islamic Trust, international agreements governing such trusts, how Evkaf land was expropriated in Cyprus, and suggestions on restitution and compensation for the property owners in Maraş and other parts of Cyprus given the current political stalemate on the island. "the British authorities illegally transferred ownership of Evkaf land"
Ersu Ekrem, the deputy chair of the British Turkish Cypriot Association (BTCA) and himself a keen researcher into Cyprus’ recent historical affairs, told T-VINE he had seen a draft of Derviş’ talk and believes the findings will be fascinating for Cypriots and others with an interest in the island. “In 2005, Xenides-Arestis, a Greek Cypriot refugee, won a famous victory at the European Court of Human Rights claiming ownership and compensation for her family land in Maraş. Yet the court ignored the clear fact that the British authorities had illegally transferred ownership of Evkaf land to her grandfather in 1913. Not only did they have no such right – Evkaf land cannot be expropriated under any circumstances – the transaction took place before the British even had sovereign control over the island!” said Ekrem. Taner Derviş will speak at three London seminars – two in English and one in Turkish – which are being organised by the BTCA and Southwark Turkish Cypriot Association, both members of the UK Council of Turkish Cypriot Associations (Konsey). All three events are free and open to members of the public. However attendance at the Parliament event requires advance registration. Tuesday 27 January, 7pm at London University – Jeffrey Hall, 20 Bedford Way, London WC1 OAL. Seminar in English. Wednesday 28 January, 6-8pm at House of Commons – Boothroyd Room in Portcullis House. Seminar in English (prior registration and photo ID for attendees is required). Thursday 29 January, 7.30pm at Regency Banqueting Suite – 113 Bruce Grove, Tottenham, London N17 6UR. Seminar in Turkish. A new biography about former TRNC President Rauf Raif Denktaş is being launched at a special event in North London. 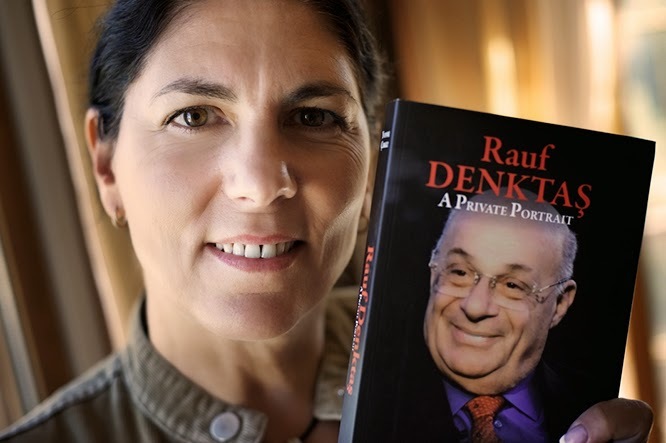 Author Yvonne Çerkez will be on hand to sign copies of her book Rauf Denktaş: A Private Portrait, which was released last September. The launch event takes place this Thursday at the Regency Banqueting Suite in North London and is open to the public. Immediately after the book signing, the venue will also host a mevlit (prayer service) for the late President, who passed away on 13 January 2012. Light refreshments will be served after the mevlit. “Rauf Denktaş, founder of the independent Turkish Republic of Northern Cyprus, spent some sixty years representing and fighting for the interests of his people in what the world would come to shorthand as 'the Cyprus Problem'. It earned him an international reputation as both a statesman and, for those he thwarted, an intransigent opponent. The politics of his long life have been well documented, albeit not always truthfully by those who cast him as the villain of a divided Cyprus, but perhaps inevitably the public man has both overshadowed and obscured the private man – the Rauf Denktaş whose personal life was equally troubled and challenging. Info and bookings: For enquiries linked to the Mevlit please call Arife Ridvan on 07713160684 and in relation to Rauf Denktaş: A Private Portrait book sales/enquiries Fevzi Hussein on 07871 606376. "Taksim Square cannot be an area where extremists are running wild." — Recep Tayyip Erdoğan, Prime Minister of Turkey (2003-2014). In his ten year reign as prime minister, never had Recep Tayyip Erdoğan experienced such a massive and direct challenge to his authority as the Taksim Square protests. On 28th May 2013, Turkish police destroyed a small campsite in a park off Taksim Square that 50 environmentalists had set up to protest the development of one of Istanbul's few remaining green spaces. What started as a peaceful sit- in quickly spiralled out of control. Over 3.5 million people took to the streets to protest, coming face-to-face with police firing water cannon, tear gas, and rubber bullets. Taksim Meydanı is a new Turkish musical about the small patch of land which sparked a national crisis. Written and directed by the Arcola’s co-founder and artistic director Mehmet Ergen, and featuring music from the demonstrations themselves, this play is a savage, hilarious and timely attack on censorship, corruption and the brutality of the powerful. 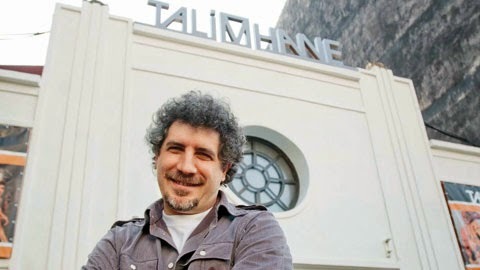 So powerful in fact that the Talimhane Theatre Group, which first staged the play, has lost its government funding as a result. Following its explosive run in Istanbul, Taksim Meydanı transfers to the Arcola as part of the 2015 Orient Express season. It’s only on in London for two nights – buy tickets fast as this is sure to sell out! An ancient underground city, believed to be the largest in the world, has been discovered in central Turkey. 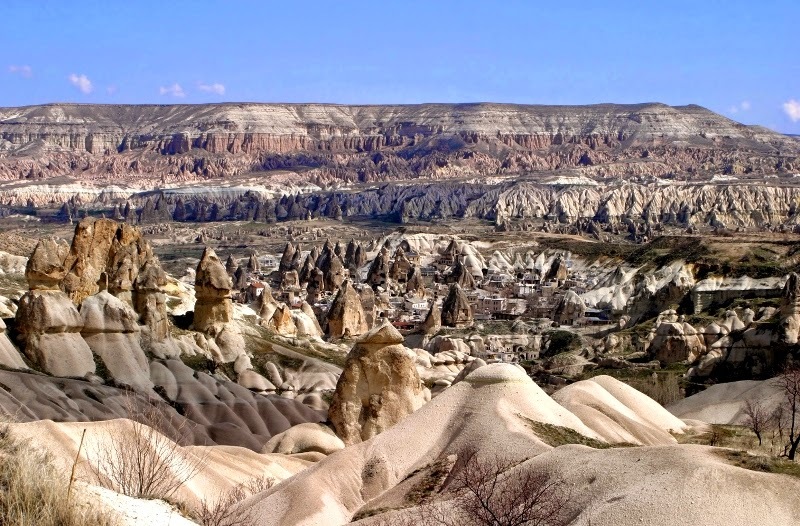 The subterranean settlement was discovered in Cappadocia, Nevşehir – an area popular with tourists. Cappadocia is internationally renowned for its stunning, lunar-like landscape, beneath which are a large number of underground settlements. This latest discovery is by far the biggest city of its kind, creating considerable excitement amongst the archaeological community. The first signs of the new settlement were spotted last year, but it was only during work for a new housing development that its full extent became apparent, with tunnels some 7 km long found. Mehmet Ergün Turan, the head of Turkey’s Housing Development Administration (TOKİ), told Turkish media that although they had spent some 90 million TL (£25 million) on the housing project, all work had now ceased, and that they do not view the investment as a loss given the huge cultural significance of the discovery. The area is now registered with the Cultural and Natural Heritage Preservation Board, which will prevent any further work from taking place. Previously Derinkuyu, also in Nevşehir, about an hour’s drive from the new site, was the district’s biggest underground settlement. The multi-level city, said to date back to 8th century BC, was large enough to house an estimated twenty thousand people and their livestock. An event in central London presenting the Mevlevi spiritual traditions of music and dance from Turkey has sold out. A capacity audience of 953 people are expected at Cadogan Hall on Friday evening to see the Konya Sufi Music Ensemble, where musicians and whirling dervishes will perform a ceremony based on the teachings established by the 13th-century Muslim scholar, poet and mystic Mevlana Jalaluddin Rumi. The Sema ceremony comprises of seven sections of both vocal and instrumental compositions that use contrasting rhythmic cycles performed by a small group of singers, a neyzen (flute-player), a kettledrummer and a cymbal player. Friday’s event was free to the public, with just a booking fee charged, following the generous sponsorship of the event by the Turkish Embassy, Yunus Emre Institute London, Turkish Culture and Tourism Office and Ziraat Bank. 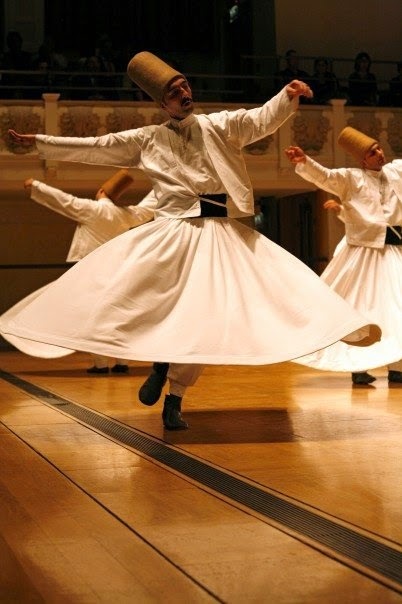 Cadogan Hall, in Chelsea, has previously hosted whirling dervishes from Turkey as part of UNESCO’s ‘Year of Rumi’. 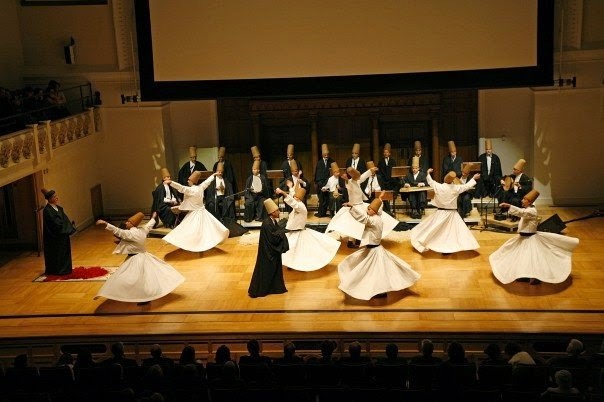 The performance in 2007, also a sell-out, formed part of the 800th anniversary world tour to commemorate the life and work of Mevlana Rumi. Konya, in central Turkey, is globally renowned for its Mevlevi traditions as it is where Rumi spent much of his adult life, before he passed away there in December 1273. Turkey’s annual export figures rose to an all-time high in 2014. 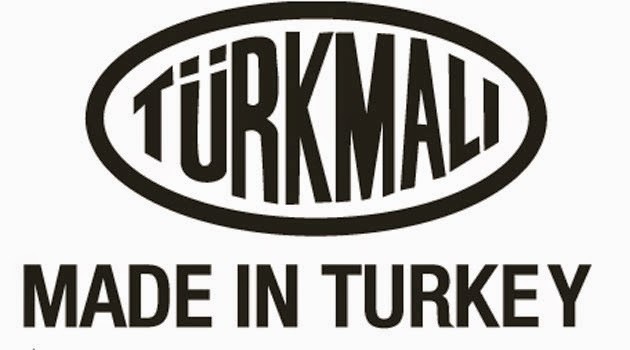 According to the Turkish Exporters' Assembly (TIM), exports grew by 4 percent to $157.6 billion last year. 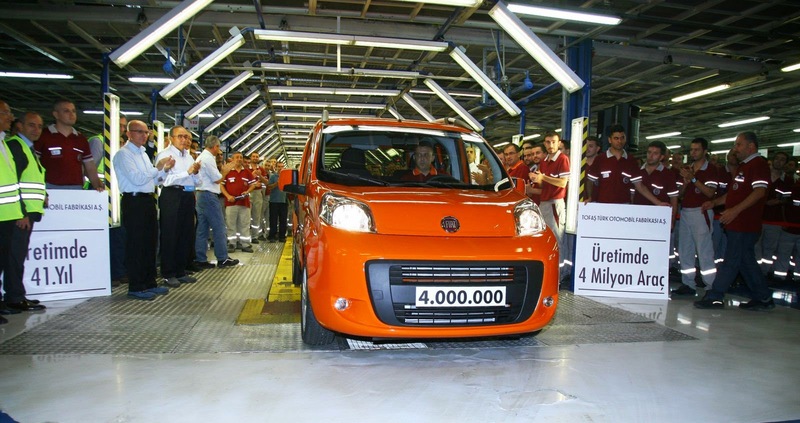 While the figures came in slightly below the government’s target of $160.5 billion, the ongoing economic challenges in Europe and conflict in Turkey’s neighbourhood meant the news was warmly welcomed by both the government and business sector. The primary sectors driving Turkish exports were the automotive industry (overseas sales of $22.3 bn last year), textiles ($18.7 bn) and chemicals ($17.8 bn), with these sectors growing between 2 and 8 percent abroad. Sales from Turkey’s jewellery, defence and aviation sectors also recorded significant increases in 2014. While exports to Europe slowed in the second half of the year, four out of Turkey’s five big export markets remain within the EU. According to Nihat Zeybekci, Turkey’s Economy Minister, the country’s leading export markets in 2014 were Germany ($14.9 billion), Iraq ($10.7 billion), the U.K. ($9.7 billion), Italy ($7 billion) and France ($6.4 billion). Turkey’s exports to neighbouring Russia fell 15 percent last year as a result of the ongoing Ukraine crisis and Russia’s currency depreciation following Western sanctions. Turkey’s key centres of export production are Istanbul, with 43 percent ($68 billion sales), followed by Bursa ($12.7 billion – or 8 percent), Kocaeli ($12.4 billion / 7.9 percent), İzmir ($8.9 billion / 5.6 percent) and Ankara ($7.5 billion / 4.8). The annual figures continue the upward trend that started with AKP’s entry into government. In 2002, Turkey’s net exports were worth a mere $36.1 billion. AKP believe they can reach $500 bn by 2023. However, there is less optimism for this year’s growth. TIM president Mehmet Büyükekşi told reporters that 2015's circumstances is likely to be more challenging, with the U.S. Federal Reserve expected to raise interest rates. "Cautiously but optimistically, we need to use opportunities in exports and we have to create new opportunities," Büyükekşi added. 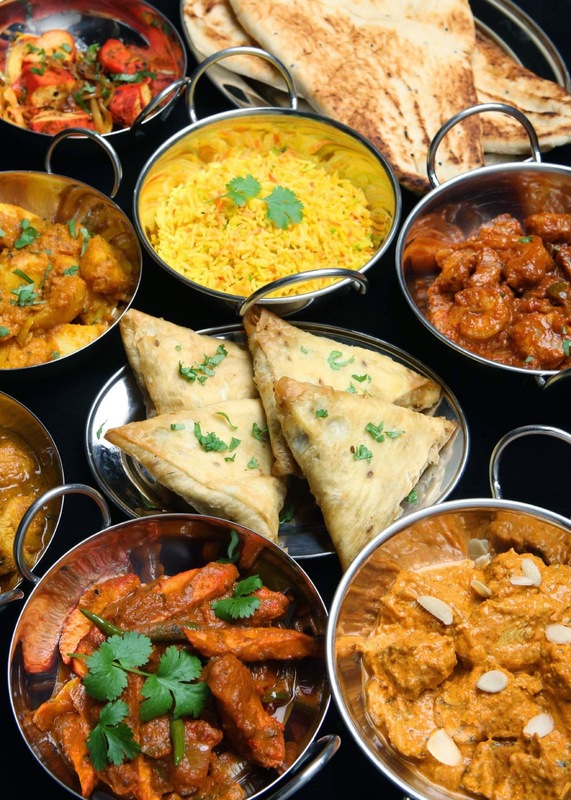 Some one thousand people attended the British Kebab Awards last night, where they were bizarrely treated to curry along with kebabs as they heard this year’s winners. 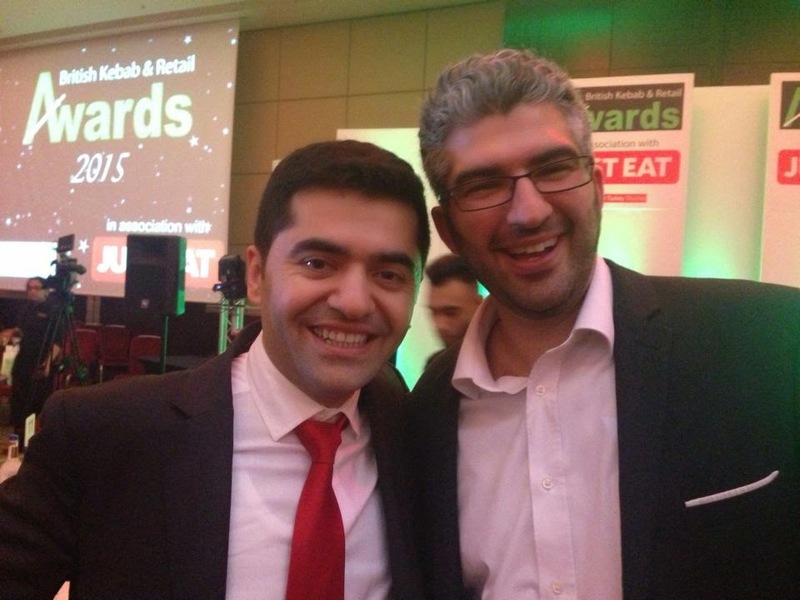 Now in its third year, the British Kebab Awards (BKA), organised by the Centre for Turkey Studies (CEFTUS) threw up a range of new and familiar names in the business, with a host of surprise winners too. The brain child of İbrahim Doğuş (restaurateur – Troia), Mustafa Topkaya (pioneering kebab restaurateur), and Timur Ekingen (editor of Londra Gazete), BKA was set up with the aim of helping to promote kebabs, both as a tasty and nutritious meal, and also for its important contribution to the British economy. The sector is annually worth £2.2 billion to the British economy. There are an estimated 17,000 businesses involved in the kebab chain – from suppliers to restaurants and takeaways – which collectively employ over 70,000 people. 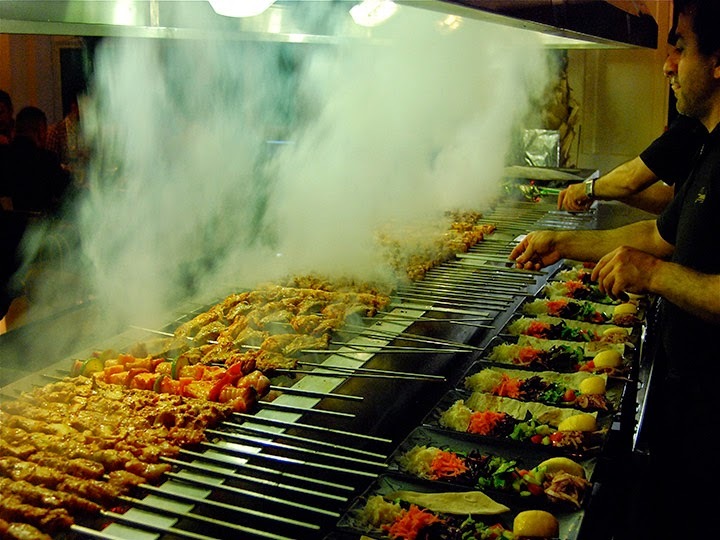 While kebabs are the staple fodder of countries from Greece through to India and all nations in between and many beyond, at the forefront of the UK industry are Turks and Kurds. They have taken what was traditionally a late-night drunken snack and presented it in a totally new light, using top quality ingredients and traditional cooking methods, some even opting for fine dining environments. The humble kebab is on an upward trajectory that will continue to grow with the likes of Alan Yau (of Hakkasan and Wagamama fame) joining the party with his newly opened West End eatery Babaji Pide and other leading chefs set to do the same in 2015. Of course, standards continue to vary and the industry is plagued by rogues. Only last week a kebab eatery in Havering, near Romford, was fined £7,500 after a 3-inch drill bit was found in a customer’s döner kebab! 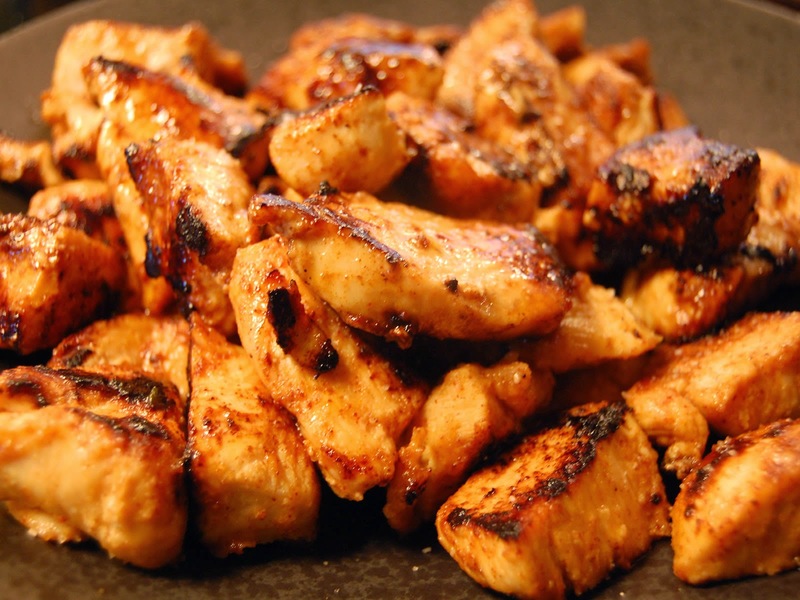 However, the positive profile of kebabs continues to grow, aided significantly by events such as these. So on to the BKA winners. 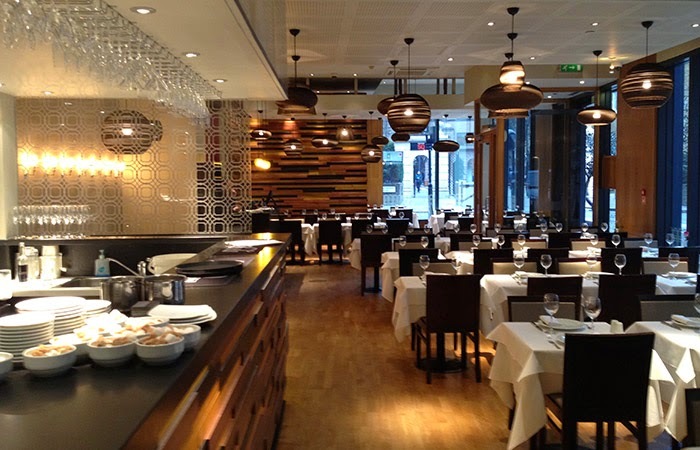 There were 14 categories, among them Best Takeaway, Best Value, Fine Dining, Best Newcomer, and Best Chef. Local politicians and people were asked to nominate the best ones in their area, and of course outlets and businesses could nominate themselves. Their local council score on aspects such as hygiene and environment get included into the scoring mix, along with how many local votes each outlet amasses. From these, a shortlist is drawn up – see here for the BKA 2015 Shortlist. The BKA judges, who this year included Baroness Meral Ece-Hussein, restaurateur James Breslaw and Önder Şahin – owner of Ev and the Tas chain – then visit all those on the shortlist to judge them on a range of criteria, while the public continues to cast their vote for their favourite kebab joints. The two verdicts are then combined and the winners determined.